On Saturday, my oldest brother picked me up so I can get some scalloped bricks from his house that he didn’t need. 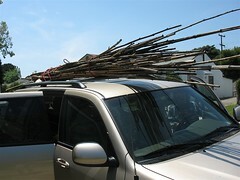 We got detoured, when my other brother called his mobile phone and told him someone was getting rid of some bamboo poles. The owner grew them in their backyard and got sick of them, so they ripped it all out. OMG! They were long! Once we got to my oldest brother’s house, he showed my some of his plants and asked if I knew what this was… and that… etc. I was surprised to see a couple plants I want… including a yellow Siberian Iris, some Hostas that were growing like weeds… along with the weeds… and some purple velvet-like Salvia. He also had some tadpoles in his inflatable swimming pool and he showed me a nest with two eggs. He said that the parents haven’t come back in a while and he’s wondering if they got injured. We’re unsure if these will hatch. On Sunday, I cut down the seed stalks of the Swiss Chard in the front yard, they were getting way to tall. We are still harvesting some of the bottom leaves, so I’m leaving those (for now). It was getting hot so I took a break, but later sorted through all my Coleus and grouped them into groups of 2, 3 or 4… I’m trying to figure how to combine them into a nice combination to plant into pots. I thought that was the hard part… When it came to planting them… Whew!… That took a while… I ended up with at least 12 pots (mostly with three plants). I also mixed in the Plectranthus ‘Zulu Wonder’ and the Taro, here and there. This entry was posted in Uncategorized and tagged coleus, kuya eddie, plectranthus, swiss chard, taro. Bookmark the permalink.